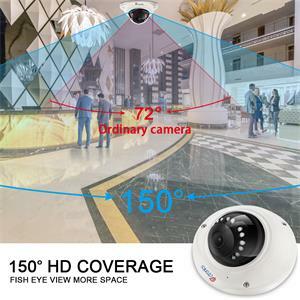 【720P Resolution & 150°View Angle】- 1280x720 HD CCTV camera, high-tech optic lens present sharper images, so just enjoy fluent video. With Full Metal Casing for ceiling and wall installation, 2.1 fisheye lens covers 150° wide angle view. 【Auto Switch to Night Vision Mode】- Up to 33 feet/10 meters night vision range in dark conditions, which could act as a deterrent against theft, burglaries, and vandalism. Support one way audio, now you can see and listen the audio and video. 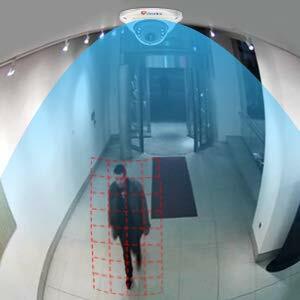 【Stay Connected with Real-time Alert】- With the help of this IP security camera, every potential danger will be identified accurately and sent to your phone and email immediately. Playback recordings from mobile phone or PC whenever you want. 【7/24 Recording Everything Important】- Motion detection camera could record a 15-second video when it is triggered and automatically record on motion to Micro SD card (Takes up to 128GB.) Warm Tips: SD card is not included in the package. 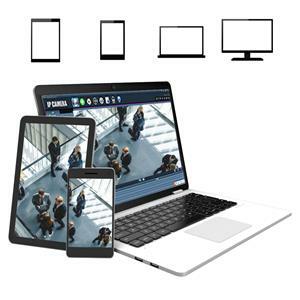 【Free Smart App & No Subscription Fee】- The security camera offers free apps for iPhone, Android with easy setup and viewing. You can finish the WiFi configuration in just 2 steps (2.4 GHz network required, 5.0 GHz WIFI router doesn't support). 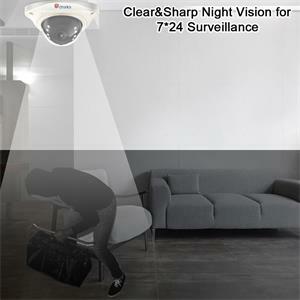 This home security camera delivers 1280*720P high definition images, so you can capture clear details around your home. A 150° wide-angle lens with distortion correction, ensures that you can see enough activity. 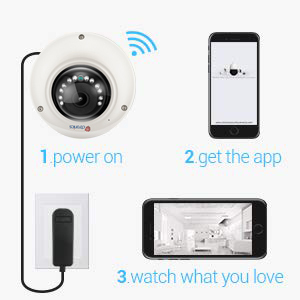 2,Wired: Connect the surveillance camera to your home WIFI router; Open our APP and add the camera by “Search camera from LAN” or “Scan QR Code add UID”, you may find the QR Code on our camera label, then you can view the camera by using wired. Infrared LED lights provide clear night vision to help you get clarity files even at the dim environment, the night vision distance can be up to 33feet. This home surveillance camera keeps recording at 25 frames per second to ensure a smooth video footage even when the items quick move. Create specific motion detecting zones to ensure the available settings are optimized for the particular scene as you want, and then you are able to get a push notification or an alert e-mail immediately when motion is detected, It also uploads and saves captured images/videos to an FTP server.